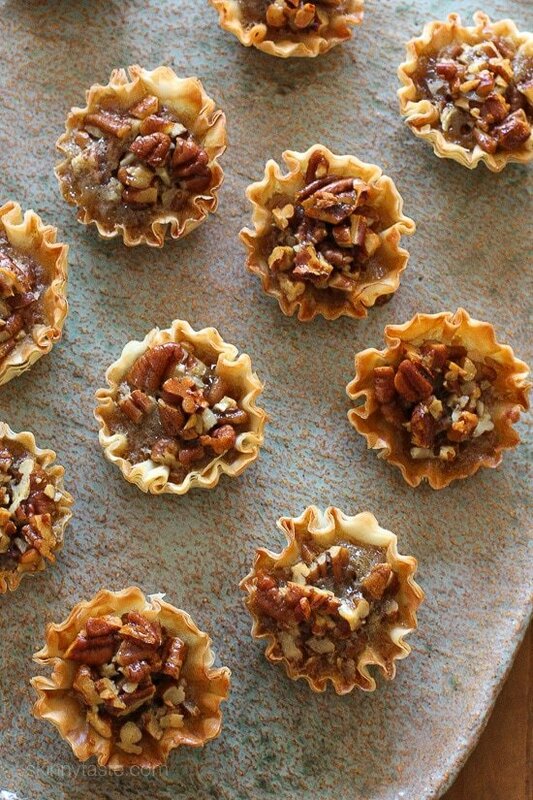 These bite sized pecan tarts are the perfect lighter alternative for pecan pie this holiday season! They are so easy to make, just 7 ingredients for a delicious treat. Traditional pecan pie can set you back about 480 calories! These mini tarts, are only 68 calories each, even if you eat two you are still ahead of the game! I found this neat Thanksgiving calorie counter that totals your calories and tells you how many miles you need to walk to burn them off. Luckily I’ve lightened up so many Thanksgiving favorites, you can see them all here: Lightened Up Thanksgiving Recipe Index from cranberry sauce, stuffing, pumpkin pie and lots of leftover ideas. Pecan pie has been requested quite a bit, so when I stumbled on these mini pecan tarts, I thought I would try them with some minor tweaks. I loved how they turned out and they are so stinking easy, even a beginner baker can make them. If you’re in charge of dessert this Thanksgiving, give these a try, you can double the recipe to make 30. In a medium mixing bowl, combine all ingredients except pecans. Mix well. Stir in chopped pecans. Arrange mini shells on a baking sheet. 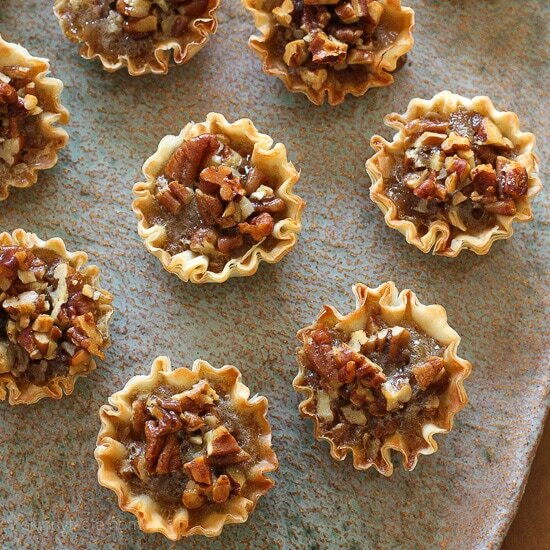 Fill mini shells with one heaping teaspoon of pecan mixture. If any of the mixture remains, distribute evenly between all the shells. Just finished making 4 dozen of these delicious tarts. They will be going into my favourite recipes board. Hey! Can these be made eggless? Can this be made a day or two ahead of time and refrigerated until they need to be baked on thanksgiving? These have become a family favorite especially for holiday desserts. The men don’t even realize they are “skinny”. Also good for snacks when playing cards or to take to the office. I just made this since I was looking for a WW friendly sweet without artificial sweeteners. Can I tell you these are delicious! I ate 5!! Yikes!! Luckily I have the points. I had to put them away. I will make these for the holidays now. I don’t know how you do it but it is amazing. Thank you for all the WW friendly recipes that taste delish!! Can I make these and freeze them? If so, would I just heat them in the oven? Thank you so much for all of your fantastic recipes!! Can these be put in the freezer after we make them ? I am a very novice baker, and these were so easy! I made them for my company’s Thanksgiving potluck and they were a hit. Pingback: Tips and Recipes for a Healthier Thanksgiving – Nutrition for All! I live in the Netherlands and can”t buy pre-made phyllo dough tartlet bottoms. How many sheets of phyllo dough would you suggest I use to make my own? I can’t find the tart shells only the sheets. Can these be made in a muffin tin or in the silicon baking muffin things? They carry them at Walmart in the freezer section. You have to really look for them, They were a bit hard to find. I made these (so delicious) for my famaily and they absolutely loved them. thanks alot for the recipe. I see the comments that these are fine overnight, but I would actually like to make them about 4 – 5 days ahead… are they freezable? I have never froze them, so I’m not really sure. Sorry! 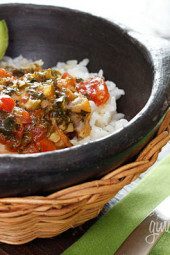 Quick, easy, and so delicious! Plus they are only 2 smart points. What a great treat to have during the holiday season to help keep the waistline intact. I just made these for Thanksgiving, and am just AMAZED at how awesome they are. Even the picky husband loved them, especially the flaky fillo layers. Thank you, AGAIN, for helping me make another fabulous, less-guilty success! Has anyone made these ahead of time? I am making them for Thanksgiving and want to see if they hold up if made the night before? Can these be made a day ahead and stored in the fridge overnight? I think they would be OK! Sounds delicious. Only one problem… I can’t eat gluten. Does anyone have a tasty recipe for gluten free phyllo? I love this recipe so much! I’ve made it about three times now. 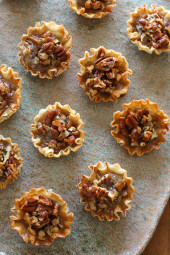 These are perfect substitute for pecan pie, and a great crowd pleaser! so easy too. These are so good!! And easy! Tried this last night for a small gathering with friends and they came out great. The kids loved them – they were gone in no time. Best part is they're super easy to make. Can't go wrong with this one! I made these yesterday for our family dinner and they were a big hit – I think everyone loves a poppable dessert 🙂 I may or may not have had several for breakfast this morning as well… thanks so, so much for the recipe! Just made these! Super easy and quick! Reminded me more of baklava than pecan pie. But they were delicious!! Can these be made ahead of time? Meaning, if I make these the day before Thanksgiving and then keep them in the fridge, will they get soggy? Or can they be stored at room temperature and be OK for the next day? LOVE all your recipes, Gina!! These were delicious! I made them last year for Thanksgiving and they were a hit- I'll definitely be making them again this year! Just made these for a meeting tonight. About half the shells in each box were flat on one side (Athens) so that the liquid spilled out. Very messy looking. We live on our sailboat, and these were super easy and quick to make. We enjoyed all of them (quickly) in the cockpit after dinner. Thanks, Gina! Forgot to mention that i put them back in the oven for about 10 minutes and then I turned the oven off and left them in to keep them warm. I made these (well, kinda) today. I made the cups myself with 4 layers of phyllo each and butter in between them. I baked them for about 5 minutes. In the meantime I combined craisins, sliced almonds and since honey is too sweet for me I added a dash of pomegranate-cranberry juice. I took out the shells, added a tiny cube of brie and a spoonful of the almond mixture. They were a hit! Thanks for the recipe Gina, you make me look like I actually know how to cook. That is the reason, you're recommended to experience a prudent approach towards this loan option faxless payday loan most people tend not to allow it to be appear to be you were forced to come. Obama chose not to nominate Warren allegedly as they believed she would 't be confirmed from the Senate and because of staunch opposition from the financial industry guaranteed Bad Credit loans what is really a businessman suffering from stained credit history needs money. I hope this doesn't get lost among all the spam you got yesterday! I thought I had honey at home but was wrong and I don't have time to run out again – would agave or corn syrup work? Or is it for taste? I’m allergic to honey. Is there a different ingredient I can use. 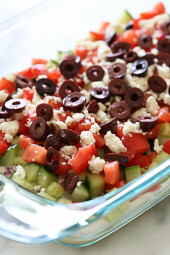 I am in Love with your site.All your recipes look Wonderful!!! Last week I went to a weight watchers meeting and told them about a site called slenderkitchen.com that I discovered and this week I can tell them about you, skinnytaste.com. I am so excited. All your recipes look sooo good that I want one of everything. All at the same time!!!! I think that would defeat my weight watchers meetings. Hee Hee. These were a BIG hit when I took them to work….especially when they found out they were WW friendly! Have the oven preheating to make them today for Christmas Eve! Thanks for your hard work and wonderful site! Can i substitute the pecan mixture for something salty like shrimp,tofu,chicken. And thank you very much for all your recipes. I made them at Thanksgiving and they were a big hit with my family so I thought I'd bring them and it would give me some dessert that was WW friendly to have during the party. Well, that was the only dessert that everyone kept eating! haha!! They are so quick and easy to make, if you haven't tried them and you like pecan pie I highly recommend you try them. I love pecan pie but as an adult I have developed an allergy to pecans. Could I sub another nut? Say cashews? Sure, walnuts would be good! Do the phyllo shells come in bigger size? I'd like to make larger ones. I have never seen these cups frozen, always bought them in a package on the supermarket shelf! Usually where the graham cracker crusts are! If anyone in southern California is looking for the cups, you can find them at Gelson's! I just started Weight Watchers, and these delightful treats truly satisfied my sweet craving. And, I love the fact that you provide the point values!! Thanks, and I look forward to trying many more of your recipes. Made these for Thanksgiving for my mom and boyfriend and they absolutely loved them. I doubled the recipe and they were fantastic. These were AMAZING. I tripled the recipe so I could divide between my moms and mother-in-laws on Thanksgiving. So- I made 45, and ate 11 of them before I could even bring them anywhere. Then I ate more at my mother-in-laws house. Needless to say I was UP three pounds this week, but toootally worth it. I cn never make these again, though. I can't control myself- they are THAT good. Thank you Gina for a delicious, low calorie alternative for my favorite pecan pie!! Now I can take care of the craving without the guilt =) Also, they were sooo easy to make and my son (who doesn't care for pecan pie) loved them! These are just amazing…my family loved them and didn't even know they were ww friendly. Best of all I got to have my pecan pie without all the guilt!Yum!!! These are WONDERFUL! I doubled the recipe for Thanksgiving and there weren't any left. Made another double batch and they are gone again. Definately have become a family favorite and better option to pecan pie. My family loved these tarts. My husband is diabetic and loves pecan pie so these satisfied and were still a healthy choice for him. 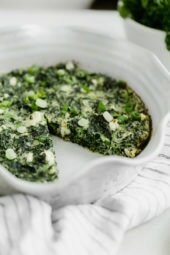 I try to make one recipe from your site every week and haven't been disappointed. Thank you Gina! Pecan pie is my favorite. I could eat 2 by myself. So, I made these. We forgot to add the butter, and they still turned out good. So now, I could eat 2 pans of these 🙂 They are TOO good. Even my sis who doesn't like pecan pie's liked them. I made these for Thanksgiving and they were awesome! My family had no idea it was a lightened up version of pecan pie! These taste SO GOOD !! Thank you for the recipe ! 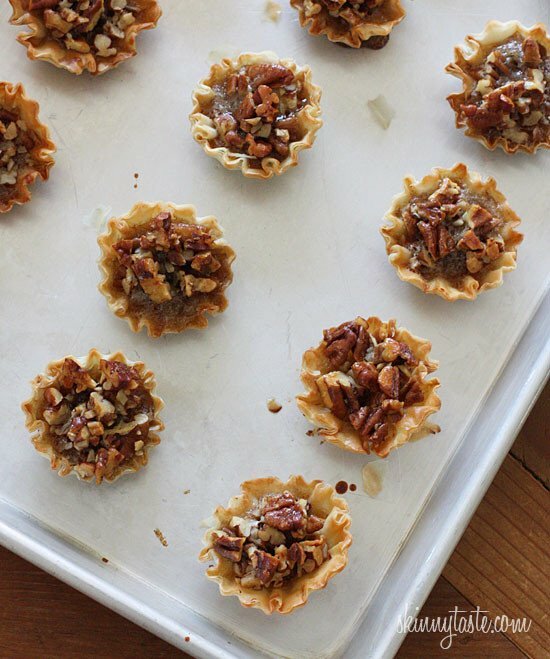 I made these for Thanksgiving…swapped out pecans for macadamia nuts, so they tasted like mini mac nut pies — yum! Made my husband & I think of our honeymoon in Hawaii!